On Saturday, 23 September 2017, Abu Dhabi Ports announced the official start of operations at Fujairah Terminals in the East coast of the United Arab Emirates. The event was celebrated at Novotel Fujairah, attended by Sheikh Saleh bin Mohammed Al Sharqi, Chairman of the Board of Port of Fujairah, Captain Mohamed Juma Al Shamisi, CEO of Abu Dhabi Ports, along with a delegation of Senior Managers, Key Stakeholders and Customers. Abdul Kareem Al Masabi, Executive Vice President-Ports at Abu Dhabi Ports, said: “We are here because our ambition is to replicate the same growth we have experienced and driven at Khalifa and Zayed Ports to Fujairah Terminals. The Port is already one of the most important economic and commercial ports operating in the UAE and we are confident we are soon to witness a significant growth in the Port of Fujairah, in addition to a boost to vital industry sectors such as steel”. 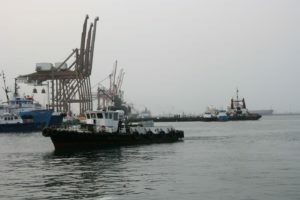 In June this year, Abu Dhabi Ports signed a 35-year concession agreement to develop, manage and operate the Port of Fujairah, under which Fujairah Terminals, a new operational arm wholly owned by Abu Dhabi Ports, was established with the exclusive rights to manage all container, general cargo, Ro-Ro and cruise operations in the port. The agreement includes further development of Fujairah Port. Abu Dhabi Ports plans to invest over AED 1 bln (USD 270 mln) in equipment and infrastructure of Fujairah, to enable it to cater for larger vessels. The development includes deepening of berths to -16.5m, constructing a storage yard of about 300,000 sqm and an additional 1km quay. Abu Dhabi Ports will also provide new equipment such as STS Post Panamax quay cranes, RTGs as well as new IT system. Maqta Gateway, a wholly owned subsidiary of Abu Dhabi Ports will be engaged to develop a Port Community System that links port communities with various departments, facilities and operations. The development of berths and yards is scheduled to commence in 2018 with the start of operations in 2020. The port will remain operational during this time to service existing and new clients. Besides, on 19 September, Fujairah Terminals welcomed the largest container vessel to call at the port, the Emirates Hana, with the capacity of 5,500 TEU.